Welcome to 8610 Cheltenham Ct. This 3 br, 3 & 1/2 bath brick ranch boasts over 2500 Sq Ft with an additional 1200 in the basement, as well as being a golf course lot! 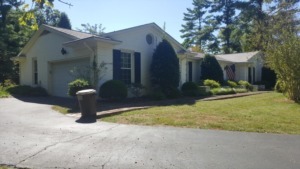 This home will need updates, but has original hardwood, as well as nearly 1/2 acre! The basement also has a sauna. This one has SOLID bones, and a great location! To settle estate, and interior pictures will be added after Nov 1. Click to schedule your showing.